I've been meaning to write about another Rapidshare downloader called USDownloader for some time now, but a reader beat me to it in my post on Rapget. Universal Share Downloader, or USDownloader, was harder to find than Rapget because its website has no English translation. Yes, there's a Babelfish link. As the FAQ mentions, the idea of using something like USDownloader is that you can queue several files for download before going to bed and wake up to see them all safely downloaded onto your computer. Of course, one thing working against this dream is the increasing use of annoyingly inventive CAPTCHAs. 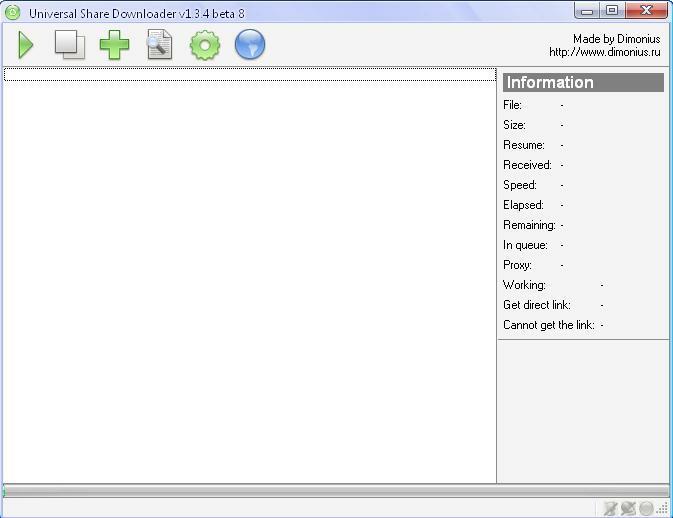 USDownloader has very similar features to Rapget, including support for several file hosting services in addition to Rapidshare as well as coming in multiple languages. Interestingly, it also supports the addition of plugins so you can add support for more sites than the default includes. it is still a beta, but works 4 me. Wow! it's a great software for download junkies just like me. Thank you. Hi, i downloaded this program and copied a few links in but all i am getting is waiting for the link, any ideas guys? All i am getting is waiting for the link, although i have a premium account. Don't waste your once daily freebie on rapidshare on another empty promise of rapidshare premium account numbers, "just don't change the password! ", or on generators that don't work. and try this way to get a rapidshare account of your choice. There is a simple, legal way to take your own rapid share account (even for one year) from earning virtual moneys. It really works !!! now after registering you are ready earn the money and the money will be transfered to your paypal account and that paypal account that be used to buy anything on internet…Now I’m really close to bought my own rapidshare account for one year by earning money online and its much easy……just browse the net and earn the money …so simple…. note:- do read getting started at the website when you register it….it will take only 5 mins but will help you a lot…. credit will be automatically transferred to ur PayPal account when u have 20$ in your SlashMySearch.com account. Read FAQ at SlashMySearch.com for more info. Note: Practical Advice found somewhere in Internet and works for me. Hope it helps in your real life ! Here...This is updated, new, fully automatic program that will download files from RapidShare and other sites . It will enter activation ticket automaticly. Here is installation program but it's not in english. Anyway after you install it you can change language to english or any other... For people who have problems with installation: Just click: "INSTALL" then " dalje", then "Yes" then "Dalje" and "Exit" . After you open it just go to Language botton at the top and change your laguage. Have fun.